Our 5" Wall/Ceiling Mount Bracket enables the ERH Heating Panel to be surface or wall mounted and retrofitted onto an existing structure. The longer bracket enables the 5" Wall/Ceiling Mount Bracket to be at a more optimal level for higher ceilings or structures. The 5" Wall/Ceiling Mount Bracket can be fixed at 0 degrees, parallel to the floor, rotated 12.5 or 25 degrees to surround an area, or for wall mounting, up to 70 degrees. The 5" Wall/Ceiling Mount Bracket is designed in a way to yield very minimal residual heat, enabling the heater to be only 3-1/2" away from the surface. Each heater is suitable to heat 25 square feet of space at a ceiling height of 8 feet to 9 feet. Our 5" Wall/Ceiling Mount Bracket supporting our ERH Heating Panel are an excellent way to meet all outdoor or indoor heating needs for any high end - high traffic restaurant or cafe. Finish: Silver. 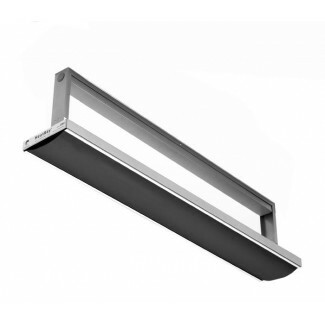 Heaters can be wall and ceiling mounted with various brackets available. Length of bracket arms 5"
Our Radiant Heating Suspension Brackets Collection has a lead time of 3 - 8 weeks from the time your order is processed.